Knowing when it’s worth trying to retain employees after they’ve handed in their resignation is a challenge. Life science companies naturally want to do everything to keep their highly-skilled talent. But when it comes to offering disengaged employees retention packages to stay, is it always in the best interest of the employee and the company? The cost of recruiting someone will undoubtedly be greater than a retention package. Whether it’s a 5k pay rise, a bonus or increased benefits, it makes financial sense to try incentivise an employee to stay. In some situations, the reason for an employee leaving is for a higher salary - so offering a more money could re-spark their engagement once they feel better compensated for their work. With more senior employees or those with specialised/in-demand skill sets it is certainly worth working hard to address these underlying issues to persuade them to stay on. While it’s important to consider the company’s best interests, when negotiating be aware that it is a very personal process for the employee. They’ll be looking for a significant improvement in the quality of their working life and career prospects, so think outside the box when working out a retention strategy. Instead of just offering a pay rise or bonus, ask them about their needs and offer benefits tailored to them. Could they benefit from flexible hours, working remotely a few days a week, childcare vouchers, a company car? A sympathetic, genuine approach to making them happier at the company will go a long way. It could be that both the company and the employee could work harder at progressing their career. For example, the employee may be guilty of not putting their ideas forward enough, but the manager could have tried harder to seek their opinion or involve them in more projects to help develop their career. Suggesting that they move teams or relocate to a different office could resolve any issues with current colleagues and offer better career development opportunities. Money is only one incentive and not usually enough to make someone stay long-term. Throwing more money at a situation won’t always help, even if you’re keen to keep them. The employee could always accept the pay rise and leverage it to get an even better deal elsewhere. Beware of employees who are simply playing companies against each other to get an inflated salary. Because of this, some companies refuse to respond to financial counteroffers in fear of setting a precedent. Even if you are offering more than a salary increase, try to be honest about how realistic the retention package is for the employee’s longer-term engagement. Think about how the changes will be implemented and if they will negatively impact the wider team. There may come a point in which it is no longer in the company’s interests to appease an employee who has their foot half way out the door. There is always the issue of how the employee is viewed if they agree to stay on. Will there be any bad feelings towards them by their manager or team? They may be seen as disloyal or less committed to working in the company’s best interests. Their productivity may be questioned. These negative feelings towards them will do nothing to increase their engagement with the company. Sometimes, letting them go with no counter offer is the right thing. It does the employee a favour as they’ll be happier elsewhere and your company can find a more committed and engaged replacement. Even if this is costly in the short-term, it’s made up in the long-term by the increased productivity of an employee who is more compatible with the company’s culture, values and goals. Instead of putting lots of energy and resources into retaining a disengaged employee, invest in systems that will help you to spot signs of disengagement before employees get to this stage. These could include regular performance reviews and frequent employee engagement surveys which give employees a platform on which to express their views, needs and wants. Devising and implementing an employee engagement strategy across the business is worth the effort: if executed well, you’ll see employee engagement and commitment to the company increase and productivity soar. 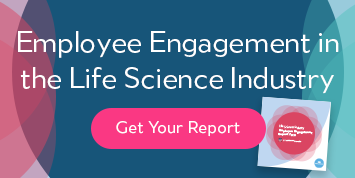 Begin by finding out the current levels of employee engagement in the life sciences industry, and use this as a bench mark to rejuvenate engagement and increase employee retention at your company. If you decide it’s best to let a disengaged employee go, consider working with ProClinical to help you source a highly-skilled professional who is more in line with the company’s culture and goals. For more information on how to improve staff retention through employee engagement, download our life science engagement report today.